Nina Ricci will launch Luna Blossom this week in duty free. Luna Blossom is a flanker to Luna, which was introduced earlier this year, and is styled as a "modern fruity floral fragrance tailored for Asian consumers". Luna Blossom is a delicate caress of fresh flowers enfolding a cedar, musky sparkling harmony conceived by Fabrice Pellegrin, the son of Master Perfumer Olivier Cresp. The Luna Blossom girl reveals her mysterious, captivating, spontaneous and sensual sides. Luna Blossom scent opens with succulent Nashi pear and dazzling bergamot. The heart beats with the mingled rhythm of jasmine, magnolia and peony. This happy marriage of delicate petals, with their pastel gleams, delicately takes over our sensations. Then comes cedar, then musk. In sparkling harmony, they graciously enfold this sensually floral bouquet. Its luminous, irresistibly modern ingredients just take your senses away. 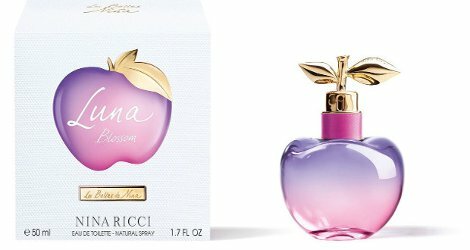 Nina Ricci Luna Blossom will be available in 50 ml Eau de Parfum.